Mere mediocrity on the part of the superhero sidekicks doesn't seem a high enough bar for inclusion in a tome such as The League of Regrettable Sidekicks. The very idea of the sidekick for a superhero is fraught with goofy associations. The most famous sidekick of all time, Batman's sidekick Robin, tended to be a bit of a punching bag for longtime readers, to the point where perhaps the most memorable moment of Robin's time next to Batman was when -- as voted on by readers via 900-number -- he was killed at the hands of The Joker in the infamous A Death in the Family story arc. Sidekicks tend not to appear for their necessity to the stories, nor for any particular attachment to the primary heroes. Rather, sidekicks tend appear because a lone wolf needs a reason to talk. They are stand-ins for the readers, a way to insert a lesser, but still good-natured voice to the proceedings to serve as a sounding board, a voice of reason, or even a mild antagonist to the hero. By way of a personal relationship, the hero of the story is given the depth necessary to become a long-running character. Of course, that's not to say that a sidekick is always a good idea. 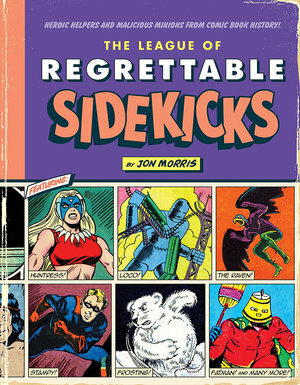 That's the driving force behind Jon Morris's The League of Regrettable Sidekicks, an amusing, educational, encyclopedic volume that explores a wide variety of sidekicks whose creators might wish had been forgotten, sidekicks that probably never should have seen the light of day. In finding so many examples, Morris shows us almost every single way a sidekick can go wrong. It starts slowly. In the early Golden Age (1938-1949) sidekicks mostly don't seem all that regrettable, so much as they seem quaint. Take Algie, for instance, the sidekick to one Barry Kuda, himself a less-celebrated contemporary to Aquaman. Algie is perfectly serviceable as a sidekick, getting into trouble as often as he his helping Barry, and the only trait that lands him here, really, is the all-too-cheesy moniker he has been saddled with. That's a fine enough reason, I guess, though "regrettable" sidekicks whose only truly regrettable trait is their name could have been relegated to, say, an appendix in the back of the book. 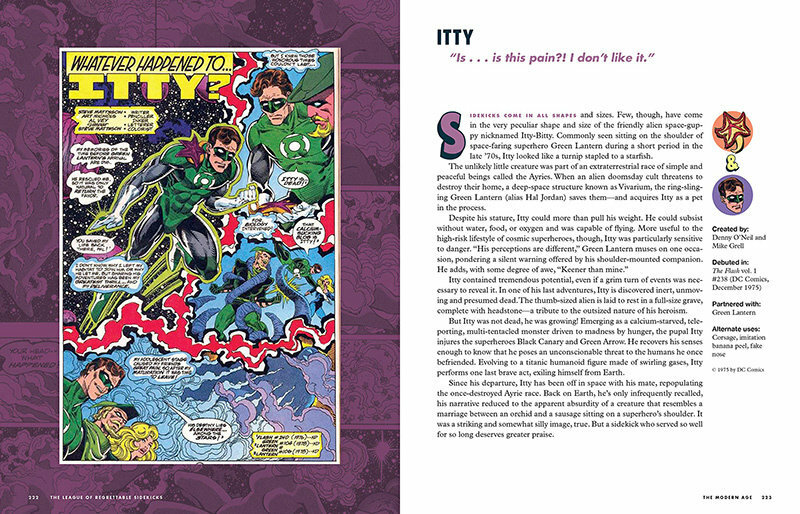 Reading about a sidekick with a lousy name isn't particularly interesting in and of itself. A number of the Golden Age sidekicks fall into this category, and the first 100 or so pages of the book is slowed by this choice. That said, without the section on the Golden Age, we wouldn't have been introduced to such classic sidekicks as Fatman -- literally a large man who wears a lampshade on his head -- and the Clawites, loyal but often hapless followers of evil fascist villain The Claw, that look vaguely like fish-men (complete with tridents) and shout things like "Heil Claw!" as they attack. These are interesting entries because their regrettable nature goes far beyond their names, existing as amusing and sometimes troubling snapshots of a time (presumed) far removed. 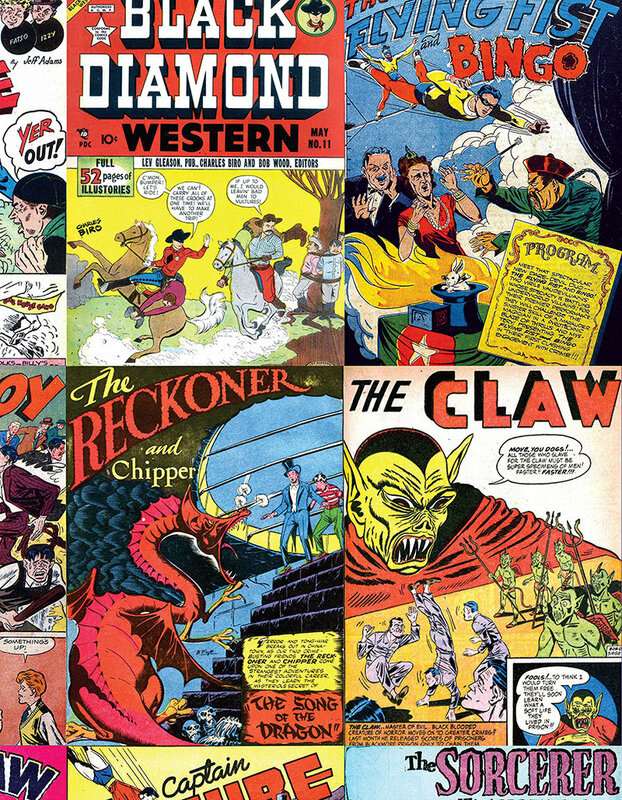 Things pick up a bit in the Silver Age (1950-1969), perhaps because a glut of popular characters ushered in from the Golden Age meant a lot of comics competing for readers' attention. In addition to the functional roles as sounding boards, sidekicks can also act as a gimmick to draw new readers in, or perhaps more likely re-ignite the interest of readers for whom a given comic has gone stale. Some of the attempts at pushing old characters into new situations and new characters into old team dynamics is downright hilarious, as is the case of the embattled Rick Jones. The primary claim to fame for poor Rick was that he hung around The Avengers all the time, and has ended up the all-too-human sidekick to just about all of them at some point, most often The Incredible Hulk. Rick served as comic relief, gained powers, used powers, became psychic, and took a job as a hacker, yet never once found his footing as a Marvel Comics mainstay. That's more than regrettable, it's downright tragic. More hilariously ill-conceived sidekicks include Superman Jr. (a silly conceit) and Super-Hip, a super cool dude who's supposed to make Bob Hope seem a little less square at the end of his comics run. The Modern Age goes from the present all the way back to 1970, and most of the humor to be found here lies in the "they probably should have known better" category. Something named "D-Man" showed up alongside Captain America for a while, a lunkheaded but good natured fellow who apparently crafted his costume out of the spare parts of discarded Wolverine and Daredevil outfits. While this could have made for solid comic relief, however, D-man wasn't goofy or dumb enough to effectively counter a then-turgid Captain America; mostly, he made Cap come off as kind of a jerk. Elsewhere, the imaginatively-named T-Force needlessly distracts from Mr. T, and "Elf with a Gun" takes the prize as the most randomly-inserted, utterly unexplained, strangely compelling possible henchman in all of comics. There's not a thesis or a driving thread to The League of Regrettable Sidekicks, apart from maybe "writing comics is difficult". It's set up like a reference book, so there's not a lot of reward for reading it front to back, though unless you're trying to conjure memories of an obscure character you remember loving or despising from long ago, it's hard to imagine a good reason to skip around. Perhaps most crucially, many of the sidekicks are not that interesting, to the point that the reader starts to wonder why they're included in this work. Mere mediocrity doesn't seem a high enough bar for inclusion in a tome such as this. Alas, mere mediocrity is what we get. This doesn't make The League of Regrettable Sidekicks a bad book as much as it makes it inessential. It's a good looking book, it's well-constructed and well-edited, and Morris sticks with a voice that's consistently wry but mostly gets out of the way of the material. It's hard to find anything outwardly wrong with it. Still, The League of Regrettable Sidekick mostly serves an eye-catching hardcover with a curiosity-piquing name that will look good sitting on a shelf.